In today's society people love learning how to be expressive through creativity while finding ways become more self sustainable at the same time. Chelsea Scanlan, of Salt Lake, has designed a program that harnesses just that. 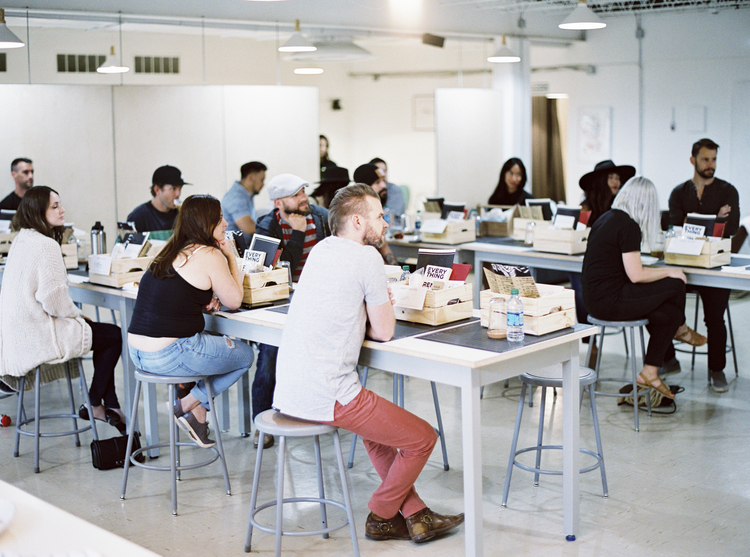 Make + Master is a clinic that helps bring the community together with a local small business to learn the basics of a skill without a monthly commitment or enrolling in a class. With the help of sponsors and like minded professionals, they bring together all walks of life to learn something new. M+M is bringing the YouTube-learning generation into a real life classroom scenario, providing its students with not only the knowledge to start practicing a craft, but also a take-home-kit of necessary tools to begin your own project. With such an awesome group of humans curating the classes, it's safe to say that this progressive way of learning is equally fun as it is educational. I was fortunate enough to receive an invite to attend a woodworking class the program was hosting. Considering that I have always been very hands on and ‘do it yourself’ oriented, I couldn't have been more excited to participate. I was greeted with smiling faces, coffee and a variety of fresh fruits. Around 10am we were introduced to Chad, an entrepreneur who runs a local company called The Furniture Joint. One day he decided to pursue his eight year hobby of woodworking and now runs his business full-time. Chad’s inspiring success story and comedic personality set the mood for the class ahead. Not only did I make a unique piece of furniture, I also made a handful of new friends. We learned about different kinds of wood, how it was cut and where to buy it. He informed us on the tools that he uses and how long the process is to create unique, handmade furniture. We had the choice to build either a shelf with a cubby and 2 coat hooks, or a sleek box to stow whatever you felt necessary. We began sanding and assembling the different pieces of wood while making sure to remove imperfections caused by the mill. We countersunk all the hardware and worked with saws cutting wood plugs to fill the holes and hide the screws. This in turn gave the piece a seamless look and feel. As the shelves and boxes began to come together, I gazed around the room noticing everyone helping one another. Something about being in a relaxed environment learning an interesting new skill really brought the diverse group together. Not only did I make a unique piece of furniture, I also made a handful of new friends. Needless to say, I had an awesome experience with and awesome organization. Memories were made and knowledge was shared. I would highly recommend taking one of these classes in the near future, you will rant and rave about it for at least a week, like myself.